Lev Vygotsky was a Russian psychologist who developed sociocultural theory – the idea that everyday interactions within our respective cultures will affect our psychological development. For example, I live in Barre, and something I see often is the degradation of people who receive state assistance by those who don’t. This relates to public perception and how we adopt certain emotions and attitudes towards specific sub-groups within a community. When it comes to hunger and food assistance, is this negative public perception accurate? Psychologically, people living in hunger are affected in many ways. “In fact, true hunger — or, malnutrition – is a dual body-mind experience that has the same deteriorating effects on every human… Even though we think of hunger as a primarily physical experience, it is important to remember that acute hunger makes learning and concentration difficult at every age.” (Desmond, n.d.) There have been times when my body has told me it needed some kind of sustenance. It is hard not to listen to that kind of message – either focus is lacking or weakness and exhaustion take over. Food insecurity is the term used to describe people living with limited access to food. In Vermont, this applies to 13% of the state population which is roughly 84,000 people, with almost half of that figure living in conditions of hunger and malnutrition. (Hunger Free Vermont, 2013) This number shows that hunger is a problem in need of attention within the state. 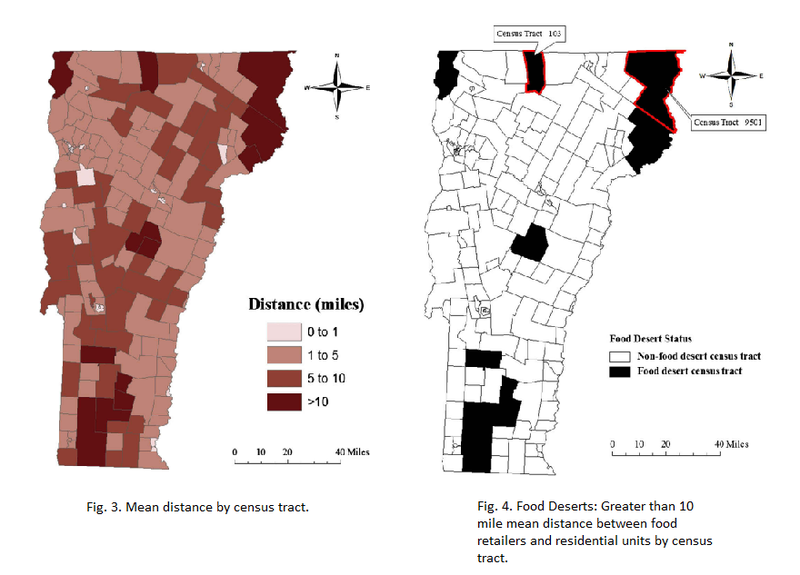 Looking at individual counties provides some information on how different areas of Vermont fare compared to one another (i.e. urban versus suburban versus rural). In a study conducted by McEntee and Aygeman (2009), they refer to the term “food desert” as a place where the price of food is not only costly, but also not readily available, stating, “We support the notion that food deserts are comprised of areas where people experience one or all of the three types of inadequate access. The interplays between geographic, economic, and informational access dictate how people access food…” and “Our results suggest certain areas of the state are at a higher risk of inadequate food access than others.” The following images shows the mean distance of food retailers on the left, and food deserts on the right, where there was a greater than 10 mile distance between stores and homes. Notice Essex county is completely shaded in the darkest hues on both figures. Essex county has the highest percentage of residents on 3SquaresVT benefits. The 3SquaresVT challenge is something a person can partake in at any time of the year, but Hunger Free Vermont really emphasizes that challenge during the week before Thanksgiving, which is when I chose to participate. My food shopping experience was more difficult than I expected to it be. I did not go in with a plan (which was advised), so I spent time thinking about what would make a decent meal that would not only be enough, but that would also last me more than one day. I was able to spend just over $27, which was $9 under the budget amount given for one person in a single week, but I still found myself trying to justify spending more on certain products that I could have gotten for less. I was not sure what to expect during the challenge, how I would feel, or what I was going to make every day. I found myself more hungry than usual, though I did eat a lot of sandwiches (as I said I would). Reflecting on the week really gave me some insight on what it was like to have a limit on food. I was not able to go to my fridge or cabinets and eat something, and I had to ration my portions so I wouldn’t eat too much at a time. It is a little worrisome to think that people not only live like I did for the week, but a lot of people live in even worse situations. I think what made me feel the worst was the fact that until we are forced to address a problem, we ignore it. Men, women, and children, in my own community, are living in food insecure households. 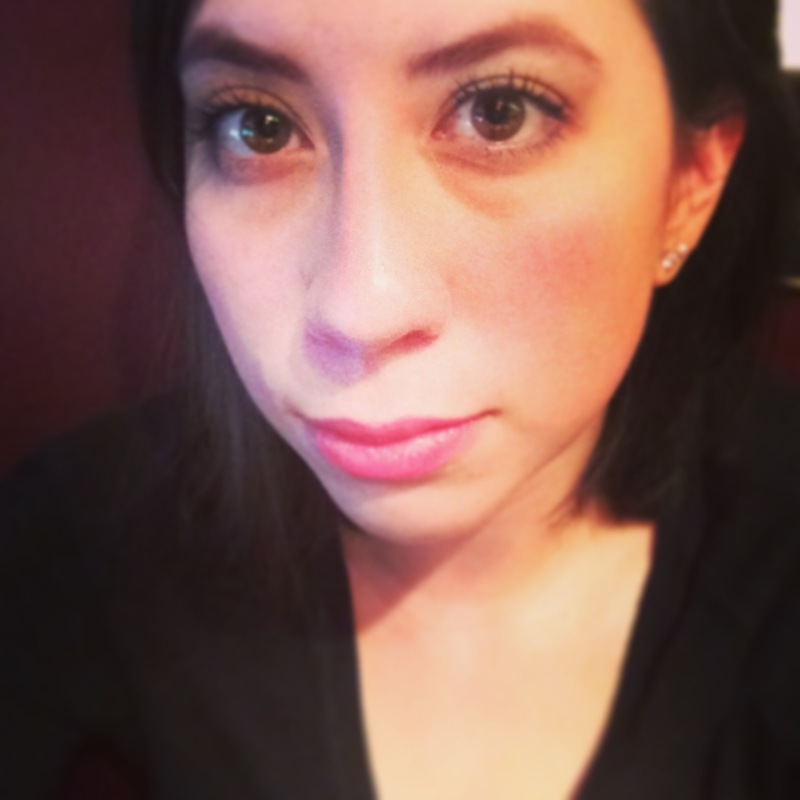 Kim England: I am still trying to find myself, and I don’t know if I ever fully will. All I know is I am a work in progress. I have a growing passion for animals and their well-being, stemming from my unconditional love for my wild and crazy pup, Eve. I lead a relatively low-key life at the moment as I focus on my education (whenever I’m not working). I am currently enrolled in STEM Studies at CCV with plans to transfer and pursue a degree in laboratory science.